Special to the Daily/Slifer Designs-Brent BinghamWith an exaggerated headboard of quilted fabric, the Water Dance bed implemented a bold shade of sea grass against pale blue. VAIL – Did you know you spend one-third of your life in bed?That being said, it would seem that too many people scrimp on the one room in which they spend the majority of their time, cheaping out on mattresses, furniture or decorations. So, if you spend that much time in that room, particularly in that one piece of furniture, shouldn’t it be one you absolutely, positively adore? Slifer Designs is doing just that – incorporating their clients greatest desires and wishes while creating bedrooms and homes for which they can adore.”Mountain Elegant” is a phrase that, in Colorado, describes everything from home decor to dressing for a charity function. Slifer Designs is working over the overworked term. Oftentimes, people will think of a lodge with a roaring fireplace and a hunting trophy to capture the essence of mountain living, but with more people spending ever increasing time here, either with second homes or as a primary residence, mountain elegant is changing to accommodate the varied tastes of the people who choose to be here. “There is no doubt that our timeless mountain designs have and continue to distinguish us in the industry,” said Johanna Alperin of Slifer Designs. “However, over the years, our mountain look has grown to include a number of diverse design styles.”No longer are earth tones, wood and stone floors the only style of mountain home one covets. They may desire an exotic, glamorous retreat after a long day in the Back Bowls, or a home that manages to incorporate the outside natural world to flow into their home seamlessly. Slifer Designs took over Donovan Pavilion recently to parade several of their fresh styles in a cutting edge way and to show off several of their talented designers by hosting a “B.E.D. Party” (for Beverage Entertainment Dining). The party featured five different bedroom vignettes envisioned and designed by each creative teams. Afterward, the beds were auctioned off as a fundraiser for Habitat for Humanity. “Slifer Designs decided to throw a bed party for many reasons,” said Alperin, the marketing assistant at the firm. “The first has to do with where the bedroom is positioned in society today. The other has to do with the direction in which Slifer Designs is heading.”With a glimpse of the five luxurious bedrooms presented at the party, Slifer’s vision is no longer only about antlers and chinked in logs, unless, of course, that’s what you want. 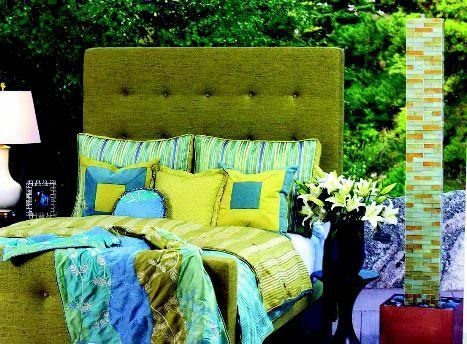 With an exaggerated headboard of quilted fabric, the “Water Dance” bed implemented a bold shade of sea grass against pale blue with black accent pieces. The colors are reminiscent of a beautiful summer afternoon in Colorado – pine trees, lush undergrowth and mountain streams. Marilyn Heaney, Linda Bevington and Jennifer Brunetto designed the room.”Pura Vida,” the popular and VIP judges’ choice for the evening, was the most eclectic of the rooms. The bed was created from rich woods and accented with crisp, white linen from each bedpost. The bedding was clean white with refreshing sky blue trim, and the pillows were in assorted, natural tones. The bed truly brought the outdoors inside, right down to the grass underfoot. The most spectacular aspect of this bed is that it is completely sustainable. From the mattress, to the wood frame, to the linens all the materials were either recycled, eco-friendly or reclaimed. “Pura Vida” was designed by Rebecca Hollister, Carolyn Gash, Nicole Beaton, Steve Foltz, Jennifer Beatty, Tom Counter, Jennifer Helm and Kim Wolfe. “As a community, we are all spoiled by Colorado’s vast landscape. We all share that indescribable feeling when we wake up in the morning, glance out our windows at the mystifying mountain views, intense rivers and vibrant wildflowers,” summed up Alperin. “Slifer Designs can enhance that beauty when brining it into your bedroom.”Founded by Slifer in 1984, Slifer Designs believes that a home is for living, not just to be admired. It should be a setting for family and friends to relax and enjoy each other, a timeless place to accumulate memories for years to come. They specialize not only in primary residences, but extend far beyond that into hotels, golf clubhouses, restaurants, retail stores and more. Slifer Designs has also extended far beyond the Vail Valley and Colorado.For more information on Slifer Designs, call 926-8200 or visit their Web site at http://www.sliferdesigns.com.